I was reading this article from Grammar Girl and I thought I’d share it with you, since several of you have asked me similar questions about collective nouns. Enjoy! Grammar Girl, when referring to a rock band, do I use the single form “is” or “are”? Does the band name dictate the usage? Collective nouns, such as the word band, are generally singular in the United States; but for band names, most people go by the rule that if the band name sounds plural (like the Beatles or Black Eyed Peas), they treat the name as plural, and if the band name sounds singular (like Fall Out Boy or Coldplay), they treat the name as singular. So in the US, you’d see sentences such as “The Black Eyed Peas were amazing at the Rose Bowl” (treating Black Eyed Peas as plural because it sounds plural), and “Coldplay is hitting the road this summer,” (treating Coldplay as singular because it sounds singular). That’s your Quick and Dirty Tip: If you’re in the US, treat band names like they sound—singular if they sound singular and plural if they sound plural—but if you’re writing with British English, treat all band names as plural. 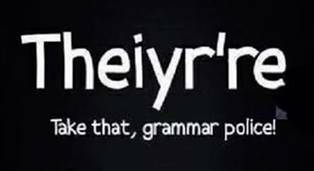 Here’s a submission from John Steinman, an answer to problems with the homonyms there, their, and they’re!